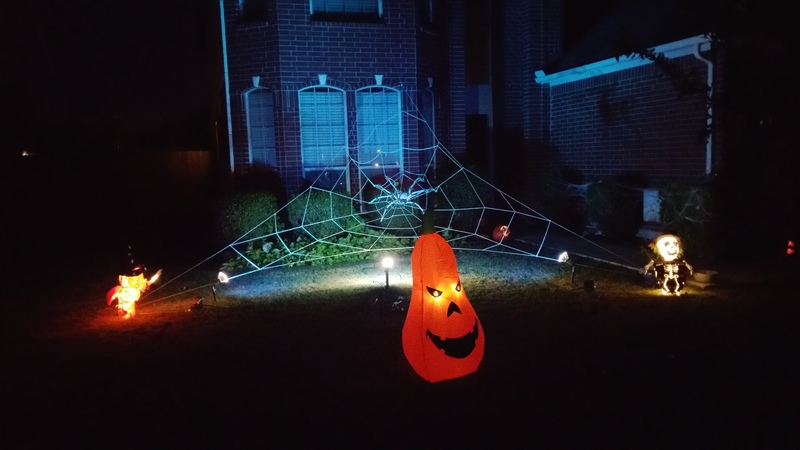 We love Halloween at our house and so do most of our neighbors! We see all kinds of great decorations, but most of them are purchased. I’m from a generation that made their costumes every year because there weren’t other options. 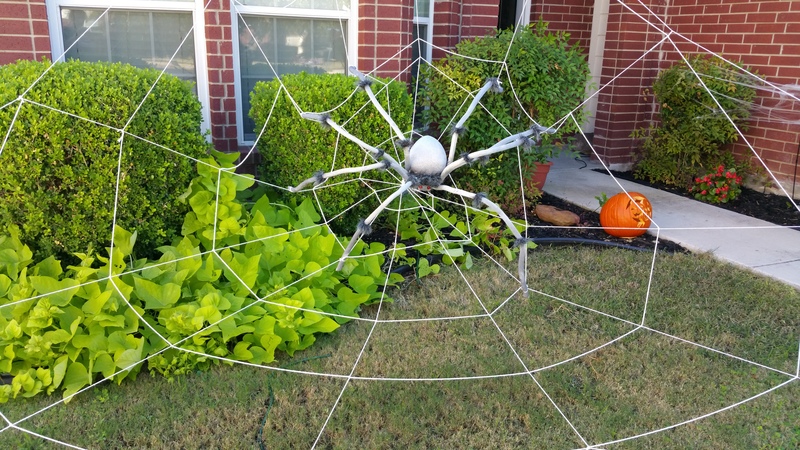 I like to decorate for Halloween but I am not interested in spending a bunch of money. 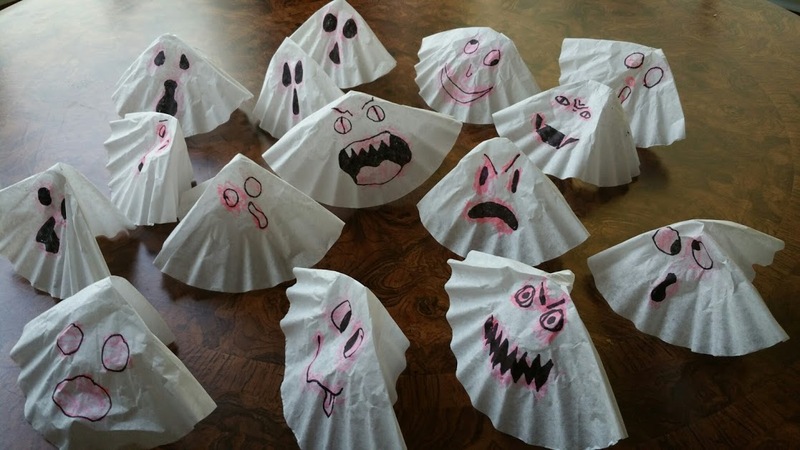 I mean really: How hard is it to make a ghost decoration? I also have young children. I wanted to do something that they could help with, so it had to be simple. I decided on a garland of ghosts. We bought a package of coffee filters and folded them into triangles. I drew faces on some of them with magic markers and my four year old colored on those. 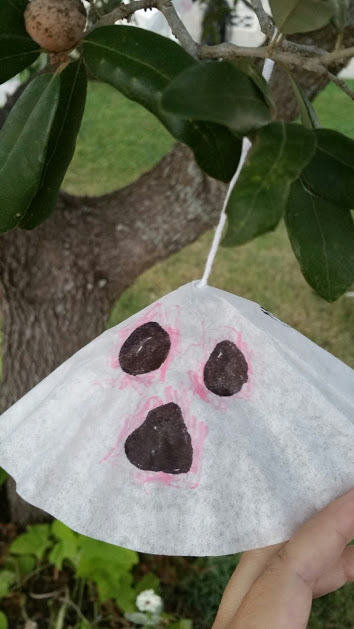 My seven year old drew his own ghost faces on his. 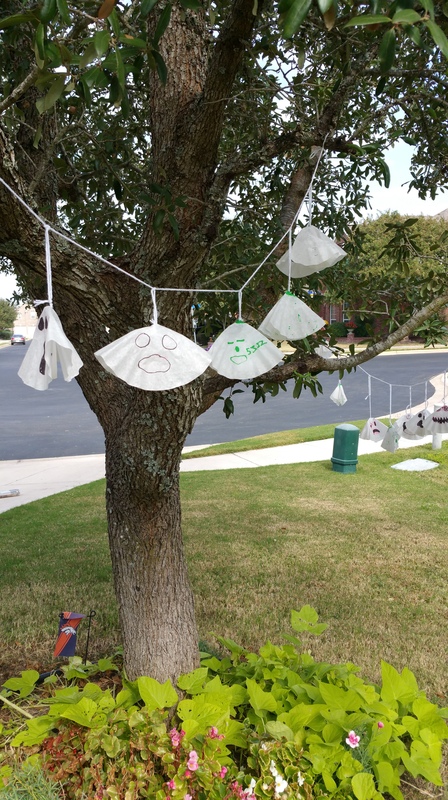 After my kids were finished I used some cellophane tape and taped the ghosts into a cone shape. 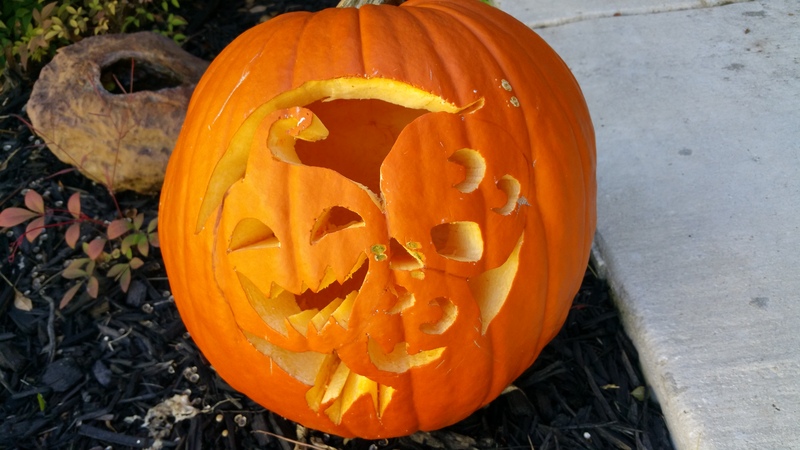 This is such a simple project and you can even finish this on Halloween night in those high energy hours between when school lets out and before it’s time to trick or treat! Fold standard coffee filters into a triangular shape. Draw your ghost/monster face. 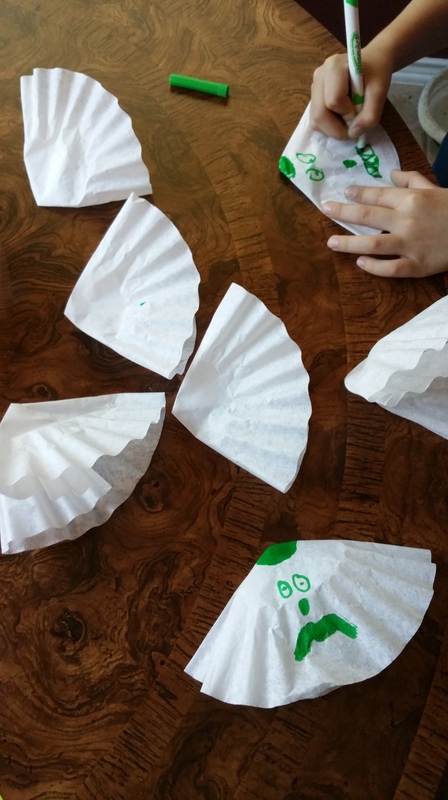 When finished tape the coffee filter into a cone shape. 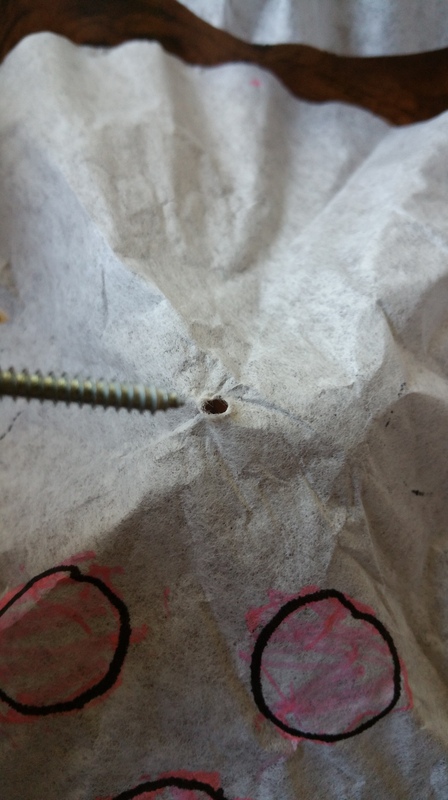 Poke a hole in the top of the coffee filter and run string or yarn through the hole. Tie the string or yarn to a screw, nut or bolt underneath the ghost/monster. 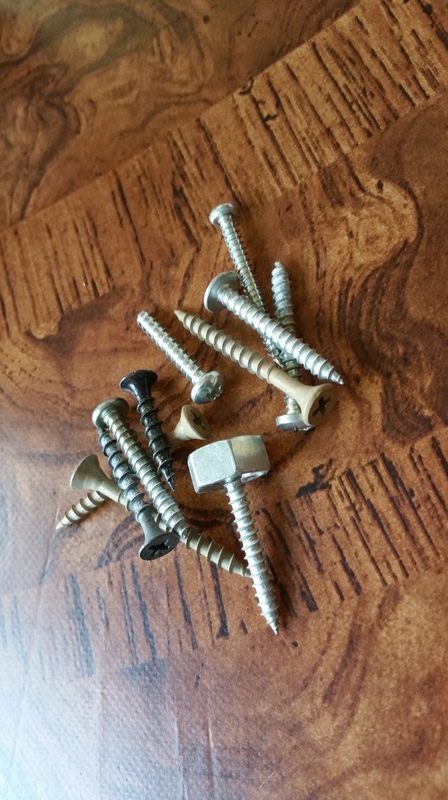 (This is a great use for all of the accumulated odds and ends in your junk drawers!) This will weight the filter and prevent the yarn or string from pulling out of the hole in the filter. Tie a loop at the top of your ghost to hang directly from a branch or take a long length of yarn or string and tie the ghosts about 4-6″ between each ghost down the length of the string/yarn to make a garland. 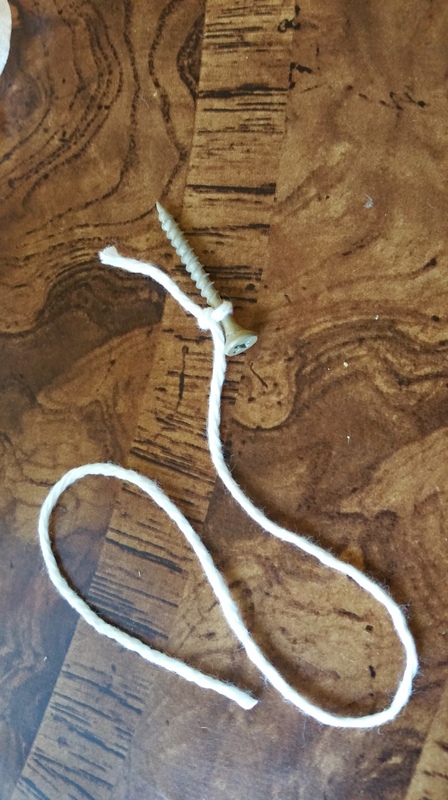 Tie the ends in your trees, bushes or along a patio railing. Y ou can also hang these inside. There you go! Super fast, super simple and you can see these from a good distance. 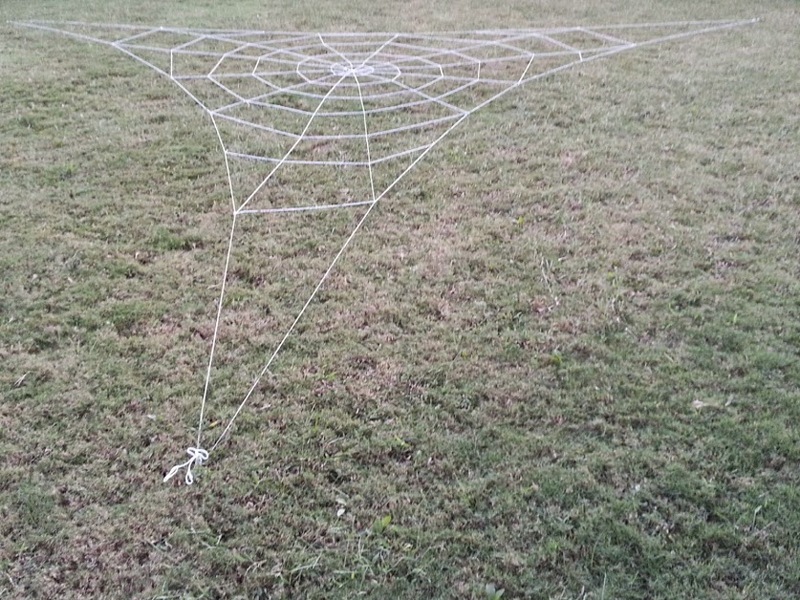 Here are some other things I made for Halloween this year: A thirty foot, two story spider web I made from yarn. 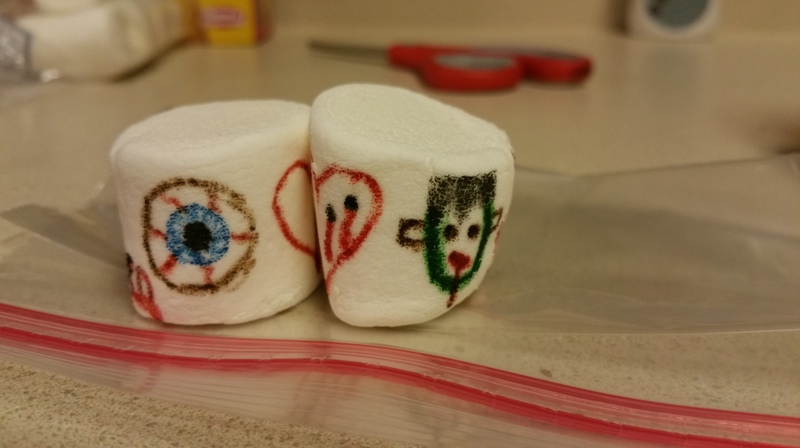 I also decorate marshmallows for my kids as a reward for finishing their lunches at school. If they have eaten all of the lunch I send with them, then I will decorate a marshmallow for them for the next school day. 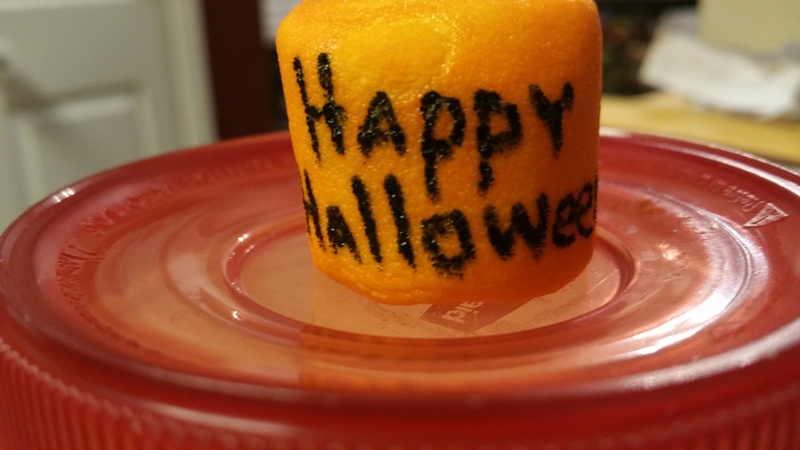 This week I did a lot of Halloween themed marshmallows. It has been very effective at our house and it’s fun to send something to let my kids know I was thinking about them. You don’t have to use these nightly like I do, you can randomly add them to lunches on nights when you have a little extra time. Your children will remember these, and more importantly: they will remember you. I like them better than notes. 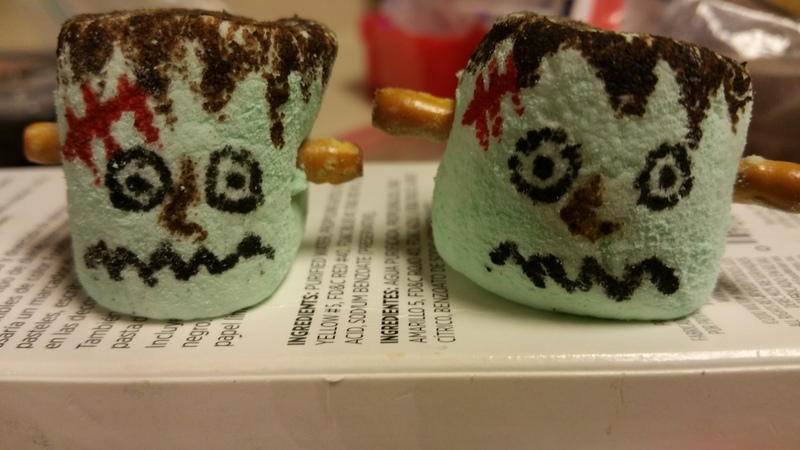 I was able to start making these before either of my children could read. I would have had to wait to add notes. I wanted my kids to look forward to remembering me at school instead of noticing a note and then hiding it because it isn’t cool to have your mommy write you love letters! I’ve been doing these for three years now. It takes very few supplies to do these although it takes a while to learn how to write on such a soft surface. 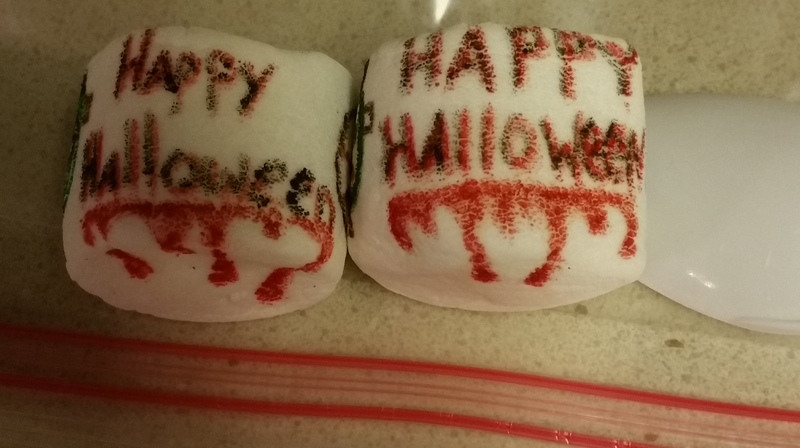 All I have to make these are some food markers and aerosol cake frosting dye colors (these are in cake decorating isles at hobby stores), clean scissors, toothpicks (currently just for my seven year old because he is old enough not to just bite into them) and food coloring added to bags of powdered sugar. I will create a post on my techniques in the future. but look at what we found on a walk in our neighborhood! 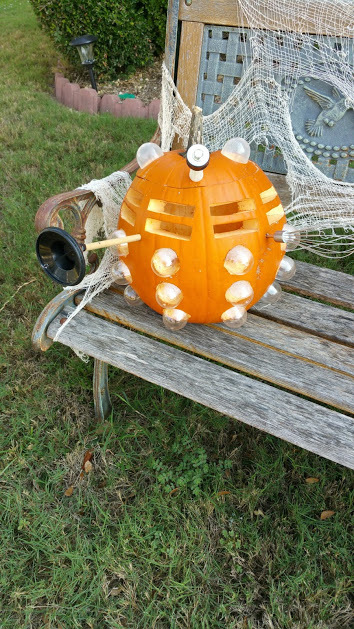 We aren’t the only Doctor Who nerds here! 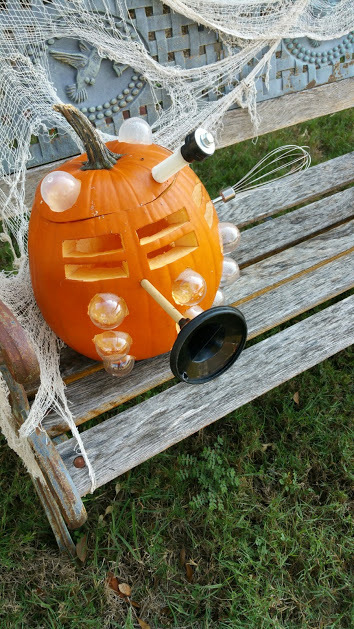 This Dalek jack-o-lantern is awesome. The clear balls look like the containers you get from the 25 cent toy machines in grocery stores. I will definitely be making one of these next year! Have fun tonight and Happy Halloween!!!! Previous PostBeginning Gardener: Class 4-Walking You Through What You Need To KnowNext PostCousin It… Oh Yeah! What cute and imaginative ideas to make with and for your kids! 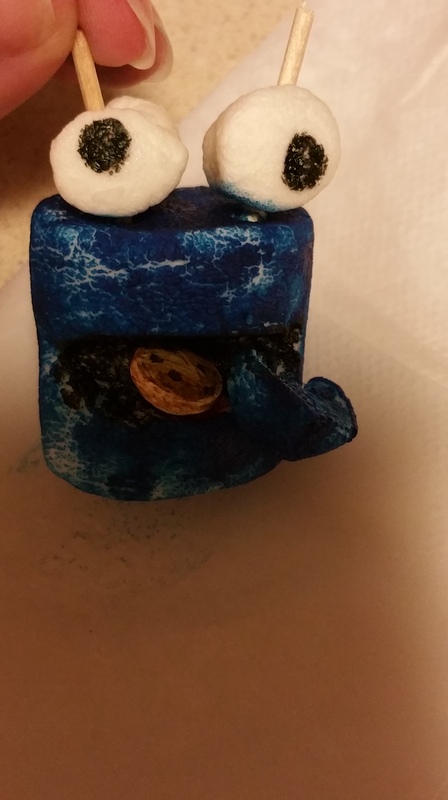 The little marshmellow creatures are adorable. They would be great party treats as well. The spider web was very sharp. You are right you kids will have great Halloween memories of fun times they had with you. Have a Happy Halloween! Thanks! It’s nice to hear from you. I’m glad you enjoyed the post! We were on holiday here so no school… Lovely marshmallows! Thanks! I’m glad you enjoyed the post. I appreciate the visit! What great ideas! I love Halloween, So much fun! It was crazy windy and rain here this year, so we didn’t get very many Trick or Treaters. The Trunk and Treat was fun too. We had a great experience this year. My two boys ended up with two gallon bags of candy each! We’re lucky living so far south. It was cool for here but still in the 70’s. Thanks for coming by! I appreciate it. Thank you! I’m glad you liked them! 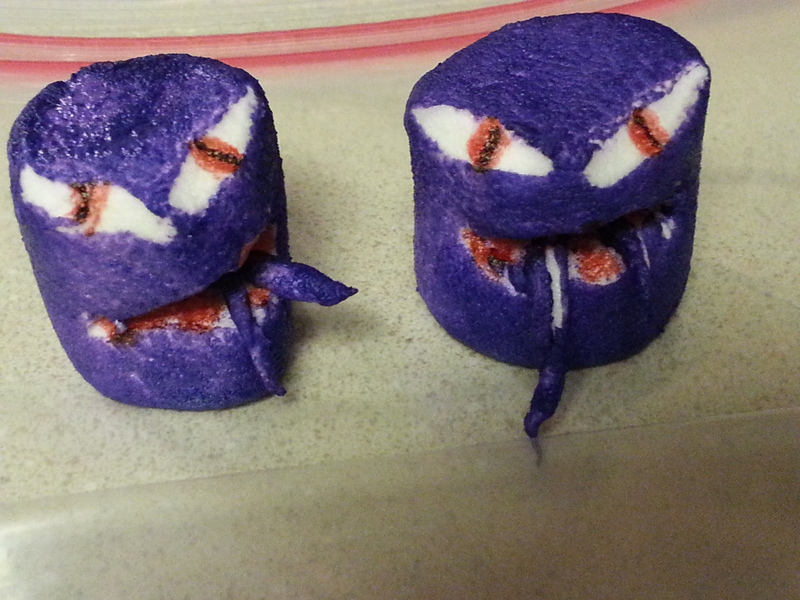 They were fun to make. 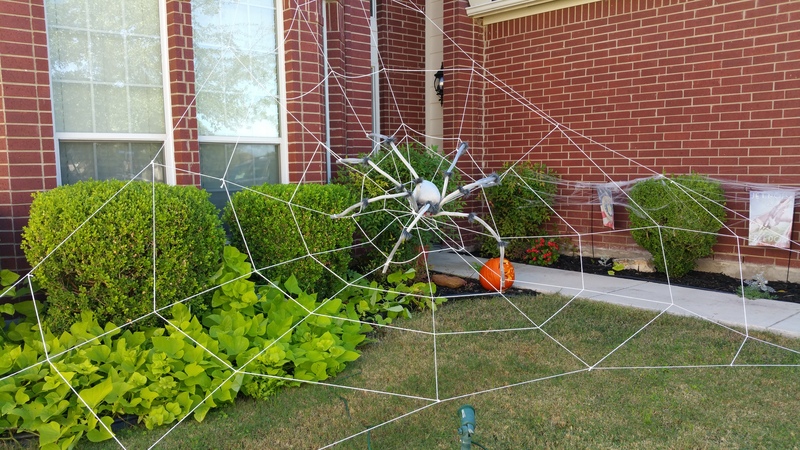 That spider and web are really amazing! Thank you! 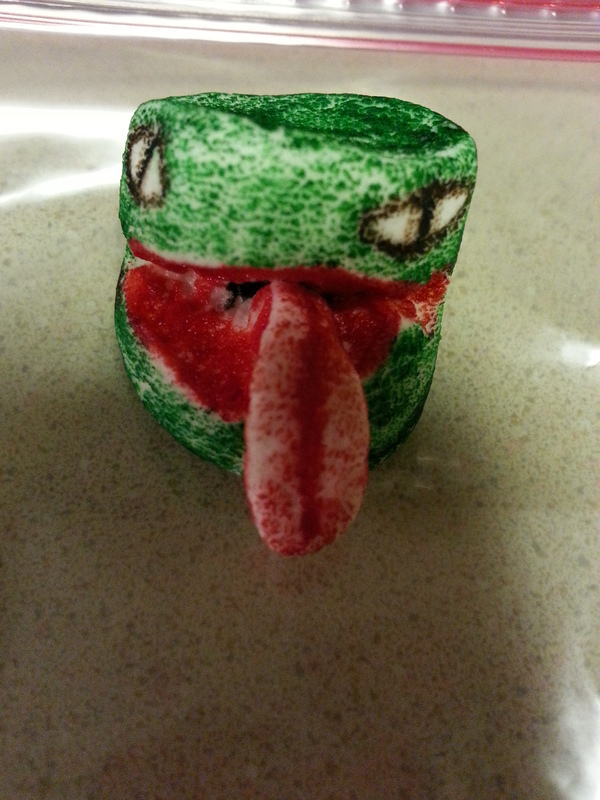 It was fun to make. I didn’t have instructions but I had a photo. It took quite a while to figure out, but it was worth it.